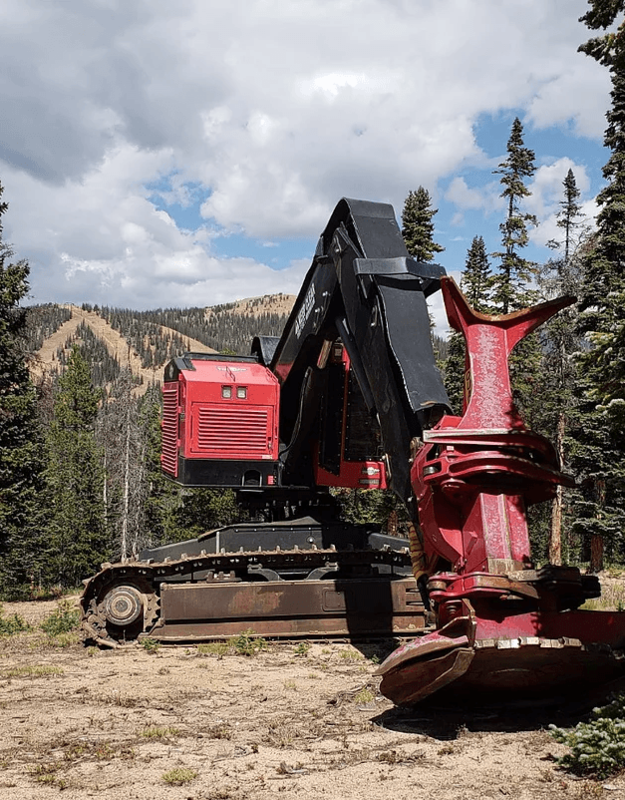 Two feller buncher machines and a processor showed up this week to begin work on the Monarch Pass Vegetation Management Project. These machines are able to select individual trees for removal while leaving the healthy trees that are designated to remain. The machines are able to then hold the tree upright as it moves it to a pile nearby where it will later be skidded to a decking location for processing and loading. The processor removes the limbs and cuts the tops and ends off the tree and then places it on the pile at the deck. Local contractor, CRS Timber Products is collaborating with Monarch Mountain and the USFS on the project this fall. The initial phase of this five-year project will focus on ground based removal areas within the ski area boundary . These locations are lower angled terrain where machines can harvest and remove the trees without the support of winch cables or helicopters. This will involve thinning in tree islands as larger diameter trees that are dead and/or infested with the spruce beetle are removed. Much of this will then be transported to local mills for processing. Other trees will be sold to firewood operations. No firewood will be sold on site as part of this project. Slash and wood chipping will be returned to the forest and used in re-vegetation and stabilization efforts. Timber operations will be moving around to different locations on the mountain during the month of September. We strongly discourage hiking around the ski area during this time. If you are up at the ski area, please stay clear of these areas where timber removal is occurring. Our summer roads will also be used by logging trucks removing these trees. There are many other options for hiking in Chaffee County. Fall is a beautiful time to enjoy some lower elevation trails along the numerous creeks flowing from the Sawatch Range where you can enjoy the changing colors of the aspens. For more information on the project or hiking alternatives, please call our main line at 719- 530-5000, or stop by the Admin offices to ask. The USFS also is a great resource on these topics and the Salida Ranger District can be reached at 719-530-3591.